It’s no surprise that Bitcoin is King of Crypto! Bitcoin came about in 2008 in the form of a whitepaper written by the infamous Satoshi Nakamoto, an alias, and no one knows who he or she is. Timed perfectly with the 2008 Global Financial Crisis bitcoin aims to solve the problems brought about by the centralised nature of our money supply. In just under a decade Bitcoin has become a viable alternative to the traditional financial system. Since then we’ve seen several economy’s collapse and endure hyper inflation. During these times Bitcoins adoption has increased saving the wealth of those suffering under the Fiat systems. The best resources to learn more about Bitcoin come directly from the www.bitcoin.org website. Don’t forget, this is called the Simple Charts Series for a reason. While you may find a lot of overly complicated charts with squiggly lines and wild predictions, there’s no need especially for beginners. In fact some of the most profitable traders use very little when it comes to charting. So what can we see here? An almighty drop that’s for sure… but what else? We’ve consistently held the lower support, with small overshoots but that’s normal. Trendlines could be more accurately referred to as Trend Zones. Not only have we held this lower support (signifying it’s strength) but the price has been consolidating since early September and if you read my first article on Metal Pay you’d have learnt the importance of consolidatory moves. 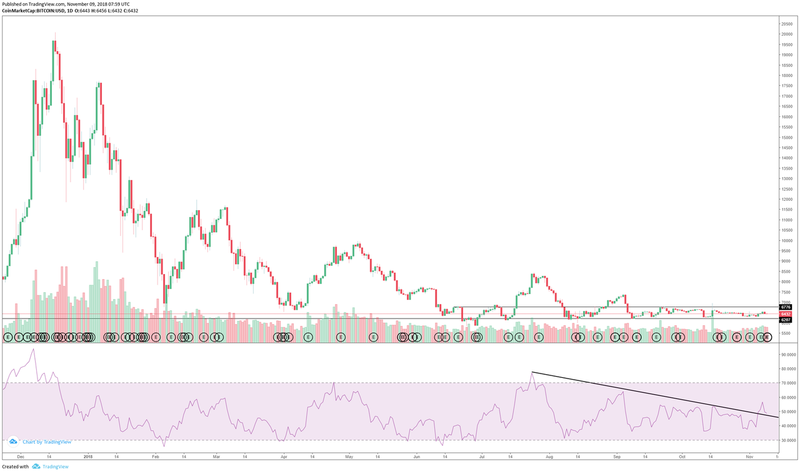 Another important move noticed on the RSI (Relative Strength Indicator) is the push above the descending resistance, signalling a change in Bitcoin’s momentum. See if you can spot the last three times it did this and how the price reacted after!